This is the third of a series of pictures from the Indonesia. 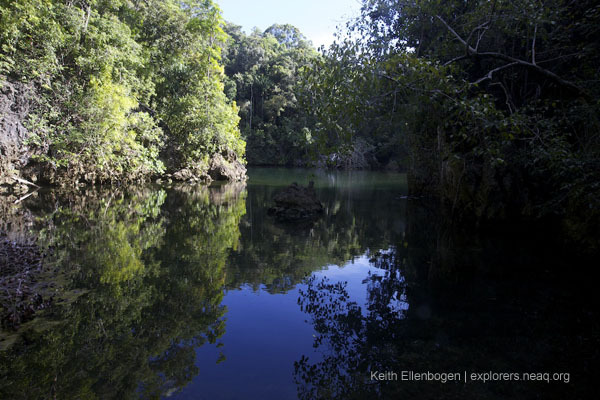 Keith Ellenbogen, a photographer and frequent contributor to the Global Explorers Blog, is sharing pictures from the expedition with Conservation International (CI) and the Ocean Health Index to create an awareness about environmental threats and solutions that impact the relationship between people and the sea. This is one of those places that was on my life list of animals to see. Within Indonesia, there are approximately 80 lakes with jellies. This particular lake to my knowledge has not been photographed before. It was a serendipitous moment when we realized one of these jelly lakes was not far away. It was a challenging hike and even more difficult with my camera equipment. To get to this remote inland lake we had to walk up and down a very steep and slippery hill — but worth all the effort. Upon arrival I was in a euphoric state. 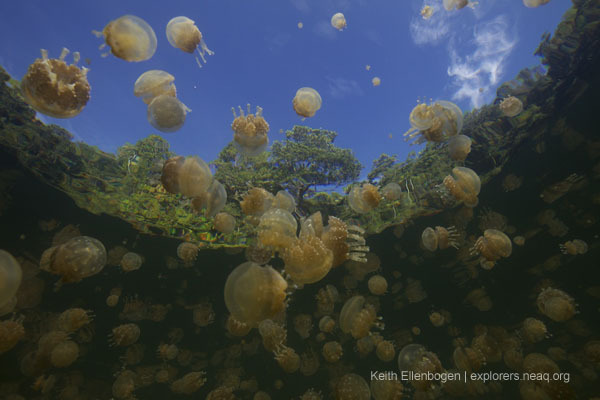 I grabbed my Sea and Sea underwater housing, put on my snorkel and mask and slowly swam to the center of the lake trying not to disturb any of the jellies while I photographed them. These are non-stinging jellies and as they bumped into me it felt more like a soft kiss with a just a drop of an almost undetectable numbing feeling. 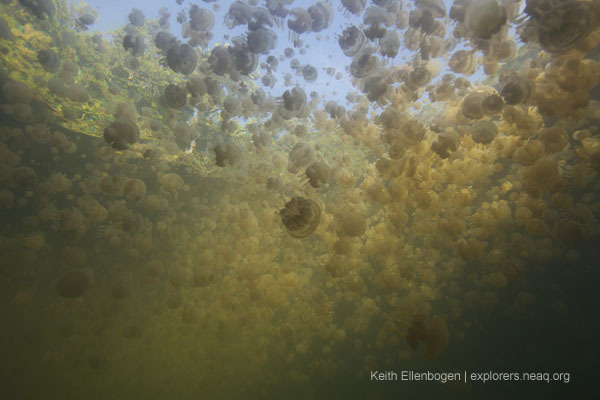 Before leaving I decided to take a self-portrait to show how densely populated the lake is with these jellyfish. 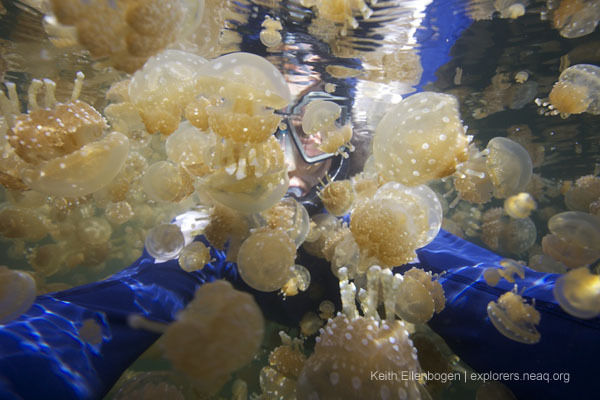 These jellies are attracted to the sun and each day they pulsate their way to the surface. These unique habitats are in part what makes Raja Ampat so special.